The launch of these two new ranges of machine follows the launch of the new color A3 machines in 2011. 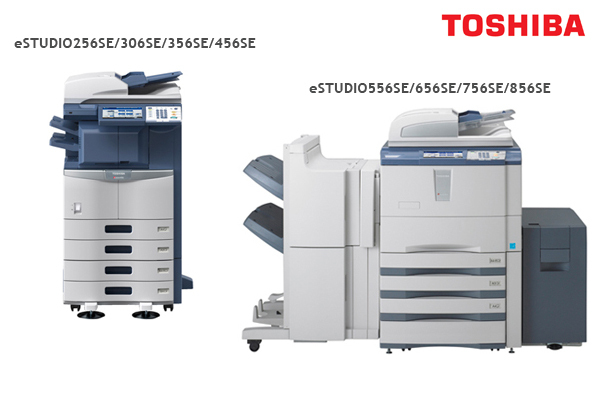 Toshiba are highlighting the "SE" badge, which means the machine has a high-security featured 160 GB hard disk (compared to the 60GB HD of the previous ranges). This new hard disk (made by Toshiba) is also standard on all the color machines carrying "SE" in their names. What is special about it in security terms is the SED (Self-Encrypting Drive) technology. Data on the disk in encrypted, and the key stored in the drive device itself. The data is rendered permanently unreadable if the HD is removed from the MFP. Also worth noting, the 25 to 45 ppm series has new finishing units: an internal finishing unit, a hanging unit (already seen on the new A3 color machines) and two saddle-stitch stapling units (of which only one seen so far on the color machines) with varying output capacities.